What a great way to spend a Friday evening! Several months ago my card group gals and I decided that we'd book the Orange County (O.C.) Wine Trolly for Friday June 29th instead of playing cards that night. The O.C. Wine Trolley is a combination of a historical tour and food and wine tasting, with a little bit of a real estate sales pitch tossed in by Al Ricci, the owner of Ricci Realty. Here's how it works. Each guest reserves a spot for about $50. Several different wines are provided for tasting and roughly 10 - 12 restaurants participate on each tour (I believe they vary, so each tour may be a little different). The trolley leaves at 8 p.m. sharp and the tour ends about 2 - 2.5 hours later. The participating restaurants donate their food and all proceeds from the ticket sales go to the Orange Senior Center. So you get to enjoy the food, wine, and history all while feeling charitable. Last night the food samples were from El Ranchito, Felix Cafe, Ruby's, Citrus City Grille, Beach Pit BBQ, Old Towne Grinder, Zitos Pizza, The Bruery, Francoli, Rocky Mountain Chocolate Factory and more. Samples included a turkey grinder sandwich, salami and cheese, delicious Cuban rice with chicken from Felix, pasta from Francoli, beef and mashed potatoes from Citrus City Grille. So much food that I had to pass on the last sample. In addition to the food, we also were treated to a sampling of several wines from Cupcake Winery from Livermore, CA. Each wine was introduced by Shaun who taught us about where the wine was from, where the varietal originated in France, and what we could expect to taste. Best of all, the last stop on the tour is Rod's - where they carry all the wines featured on the trolley and were selling them at a discounted price to tour participants. I bought two bottles of a delicious red blend called Red Velvet. The tour itself was fascinating and we learned so much about Old Town Orange. We drove through neighborhoods ogling at the historic and well cared for, old homes. Al mentioned that there are only 13 on the market right now, most over $1M in asking price. Several of the old homes we passed have been used in movies including "Big Mama's House" Al was interactive with the trolley guests with his guessing games and stumped most of us on more than one occasion. 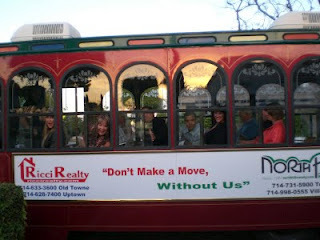 Fun, fun evening and I'd do it again or rent out the whole trolley for yourself and 25 friends!